If you haven’t already, you need to try the national dish of Vietnam, also known as pho (pronounced fuh). Pho is a delicious hot soup made with rice noodles, herbs, and sometimes meat that creates an amazingly tasty dish. To add extra dimension to your dish, pho is traditionally served with a side of extra herbs that you can add to your soup for even more delicious aromatic flavors. Here are the 10 best restaurants in Nebraska serving up the best versions of pho that you must try! IPHO #1 serves up traditional style pho with broth that meticulously brewed over a 12 hour process. The lengthy process means their broth develops unique and lively flavors. If you are looking for an authentic and delicious bowl of pho in Bellevue, then this is the place to come. Saigon Bowl has been serving up fresh and authentic Vietnamese cuisine and is a favorite among local Omaha residents. They allow you to customize your bowl and come up with unique and delicious new flavors. Vietnamese Cuisine may have a simple name, but their food is packed with complex and inspiring flavors. Known for their generous portions and amazing service, this is one of the best places in Omaha to sit and enjoy a bowl of hot pho. Noodle House in Grand Island is a restaurant that once you’ve tried you will come back time and time again. They serve up amazing pho using fresh and vibrant vegetables that create aromatic tastes. Pho 14 Noodles Palace in Lincoln offers authentic Vietnamese cuisines which includes one of the best pho rice noodle soups in the area. Try one of their many different flavors of bubble teas as well for the full experience. Pho Nguyenn serves up smoking hot bowls of pho and is a great place for a quick and delicious meal. Their broth is flavorful and authentic and served with all the classic sides. As a bonus try one of their delicious Vietnamese iced coffees. Vung Tau Deli is another Lincoln gem that serves giant bowls of pho. Their broth is tasty and the meat is always tender and perfectly cooked. The giant portions and great service make this spot a must visit. Pho Factory is an authentic Vietnamese restaurant located near the University of Nebraska. The restaurant is clean and contemporary styled with a hint of rustic feel. They offer tasty pho and many other staples of Vietnamese cuisine. Fusion Taste has been serving their customers delicious pho and other Vietnamese dishes. Try their pho and spring rolls for a quick but amazing lunch. To drink the boba tea is also a great choice. Saigon Surface is a modern restaurant with a lounge feel that is a great place for dinner or date. 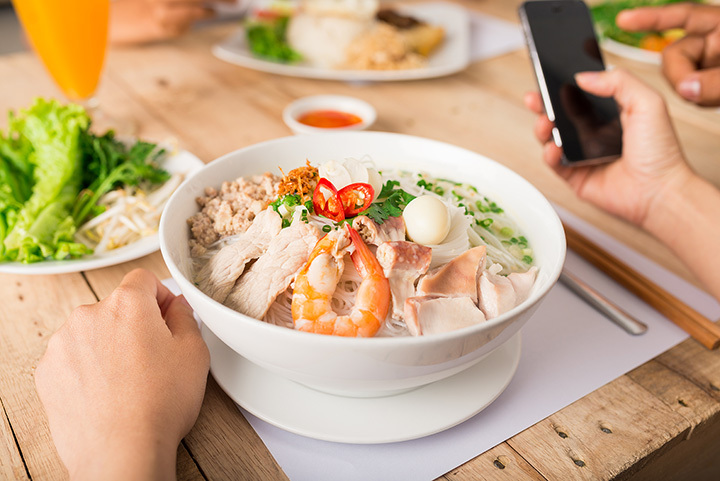 Located in downtown Omaha, the restaurant has been quickly known as one of the best places around to get a bowl of pho and enjoy Vietnamese tastes in a vibrant and classy atmosphere.